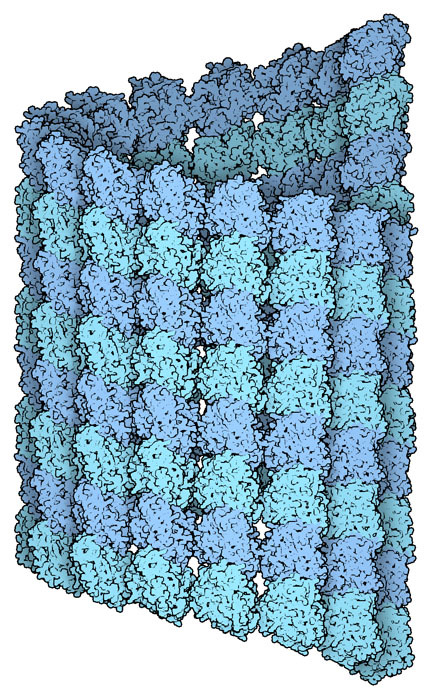 Tubulin assembled into a short microtubule. Microtubules are the railways of the cell. They are huge, sturdy filaments that extend through the cytoplasm, providing support and providing tracks for the motion of two types of protein motors: kinesin and dynein. These motors pull many types of cargo through the cell, ranging from small vesicles to entire mitochondria. They also play a starring role in the process of cell division, separating the duplicated chromosomes into two daughter cells. Microtubules are composed of a cylindrical shell of the protein tubulin. This tubulin comes in two similar forms, called alpha and beta tubulin, which form a tight dimeric complex. They then stack side-by-side to form the cylindrical tubule. The first structure of tubulin, from PDB entry 1tub (not shown), was solved by studying flat sheets of tubulin by electron crystallography. The structure shown here, from PDB entry 3j2u , was solved using a crystal structure of a tubulin dimer to interpret a reconstruction of the whole filament (complexed with kinesin) from electron microscopy. Only a short piece of the filament is shown--in the cell, microtubules are much longer, with thousands of tubulin subunits. Microtubules are in a constant state of growth and shrinkage, in a process called dynamic instability. This is controlled by a molecule of GTP that is bound to the beta subunit of tubulin. Free tubulin dimers have GTP bound, and this forms a stable complex when it adds to a growing filament. But later, the GTP is cleaved to GDP, and the GDP-bound tubulin is less stable in the filament. If the GDP-bound tubulin is at the end of the filament, it can start a process of disassembly. If, however, a new GTP-bound tubulin binds to the shrinking end, it stops the process and the microtubule starts growing again. Stathmin (magenta) destabilizes microtubules by binding to tubulin. A diverse collection of proteins assist microtubules in the many tasks that they perform, forming a variety of linkers, nucleators, and regulators. The protein shown here in magenta is stathmin, a microtubule-destabilizing protein (PDB entry 1ffx ). It binds to two dimers of tubulin, and acts by either locking up the dimers and preventing assembly, or promoting disassembly of an existing microtubule. Stathmin as been very useful to scientists. Tubulin has been difficult to study by crystallography, since it typically forms microtubules instead of crystals. The complex with stathmin, on the other hand, can be crystallized and used to determine the atomic structure. Given their central role in cell division, microtubules are the target of many important toxins and drugs. For instance, some anticancer drugs act this way: they are designed to block the malignantly rapid growth of the cancer cells by blocking the normal dynamics of microtubules. 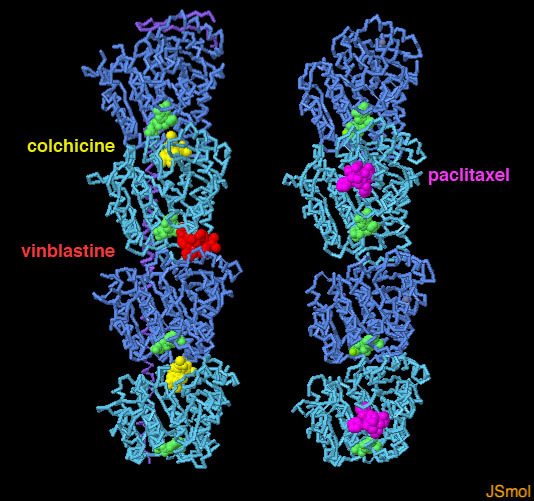 Three molecules that block microtubule action, all produced by plants, are shown here: colchicine and vinblastine block the assembly of microtubules, and the anticancer drug paclitaxel (Taxol) promotes the assembly, binding so tightly that disassembly is virtually impossible (PDB entries 1z2b and 1jff ). To look at these structures in more detail, click on the image for an interactive JSmol. The use of stathmin has allowed the determination of the structures of many different inhibitors bound to tubulin. You can use the Ligand Explorer to explore the ways these inhibitors are bound. 3j2u: A. B. Asenjo, C. Chatterjee, D. Tan, V. Depaoli, W. J. Rice, R. Diaz-Avalos, M. Silvestry & H. Sosa (2013) Structural model for tubulin recognition and deformation by kinesin-13 microtubule depolymerases. Cell Reports 3, 759-768. L. A. Amos (2011) What tubulin drugs tell us about microtubule structure and dynamics. Seminars in Cell & Developmental Biology 22, 916-926. R. H. Wade (2009) On and around microtubules: an overview. Molecular Biotechnology 43, 177-191. 1z2b: B. Gigante, C. Wang, R. B. Ravelli, F. Roussi, M. O. Steinmetz, P. A. Curmi, A. Sobel & M. Knossow (2005) Structural basis for the regulation of tubulin by vinblastine. Nature 435, 519-522. 1jff: J. Lowe, H. Li, K. H. Downing & E. Nogales (2001) Refined structure of alpha beta-tubulin at 3.5 A resolution. Journal of Molecular Biology 313, 1045-1057. 1ffx: B. Gigant, P. A. Curmi, C. Martin-Barbey, E. Charbaut, S. Lachkar, L. Lebeau, S. Siavoshian, A. Sobel & M. Knossow (2000) The 4 A structure of a tubulin:stathmin-like domain complex. Cell 102, 809-816.